Megabus is a curbside discount bus service that runs express service throughout much of the east coast. Often, the expansions mean that free ticket promo codes are available. These offers are always available for a limited time and go very quickly. You have to act quickly to get any travel deal. Time is always of the essence. Reservations can be made several weeks in advance. You have the best shot at a cheap ticket by booking as soon as the window opens. The best way to find Megabus promo codes is to follow the company on social media. They have accounts on Twitter @Megabus and on this Facebook page. Even if you can't find Megabus promo codes, the seats are still a bargain. This discount bus line promises to offer a limited number of seats for as low as $1.00. It's sure to be cheaper than parking and a lot less hassle. My last drive to D.C. from Knoxville cost $200 in gas and the traffic nearly drove me crazy. I've traveled the Megabus several times and will be taking it again. You can bet that I search for promo codes before making any reservation. If I can't find Megabus promo codes, then I can still get a cheap seat and that is always cool by me. 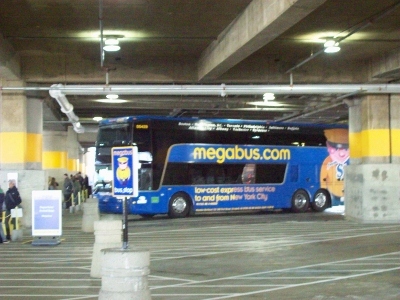 Video of Megabus stop at Union Station in Washington, D.C. Thank you for the promo code! Looking forward to my Valentine's gets-away! I'll let you know how my 1st Megabus trip goes! Looking forward to hearing about it! Have fun.